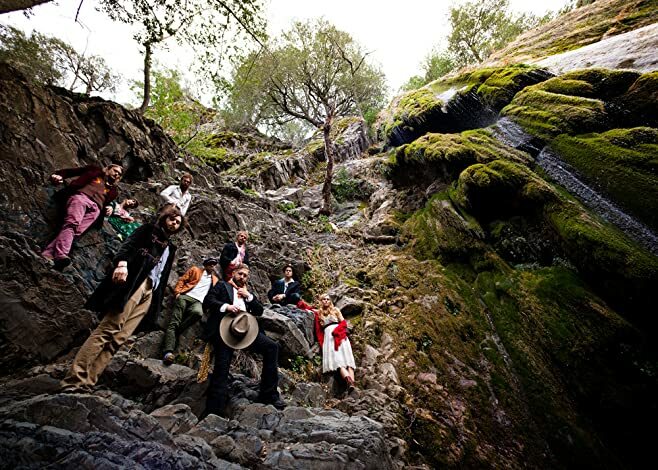 Edward Sharpe and The Magnetic Zeros have announced that they are currently in the studio recording the follow-up to their debut album, Up From Below. After an early session in Bogalusa, LA, the band has been recording at their studio in Ojai, CA. The album is self-produced and released through Community Music / Vagrant Records. Hailed by Spin Magazine as a perfect example of rock's new order, Edward Sharpe and The Magnetic Zeros will hit the road this March, playing a run of dates showcasing some of the new music and giving fans a taste of what's to come. Edward Sharpe and The Magnetic Zeros recently created and launched a tumblr page to showcase various fan pieces they have and continue to discover on the web as well as their own yet to be unveiled special content. 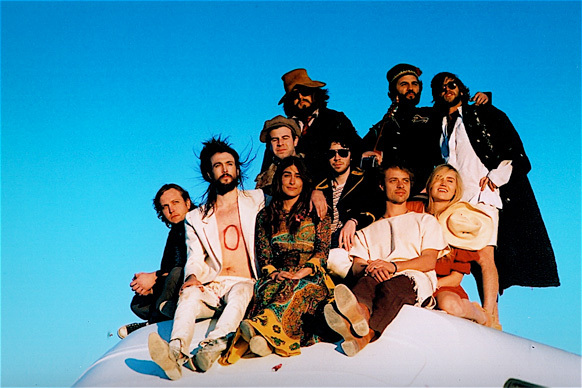 The tumblr page is a central place to dive into the community that is Edward Sharpe and The Magnetic Zeros, and will be continuously updated by the band. ¶ For most bands, a sophomore album can go one of two ways: In some cases, the energy poured into their debut fizzles, and the follow-up is comparatively flat. When we’re lucky, a band builds off of the passion they felt as a start-up and hits their stride. ¶ It’s hard to say whether Edward Sharpe and the Magnetic Zeros has hit their stride with Here, their second album—but it’s safe to say that it brings forth just as much energy as the band’s 2009 debut, Up From Below. And with three years of touring and life experience behind him, Sharpe uses the album’s nine tracks to continue exploring the themes of love, loss, redemption and joy that he sought after in Up From Below. 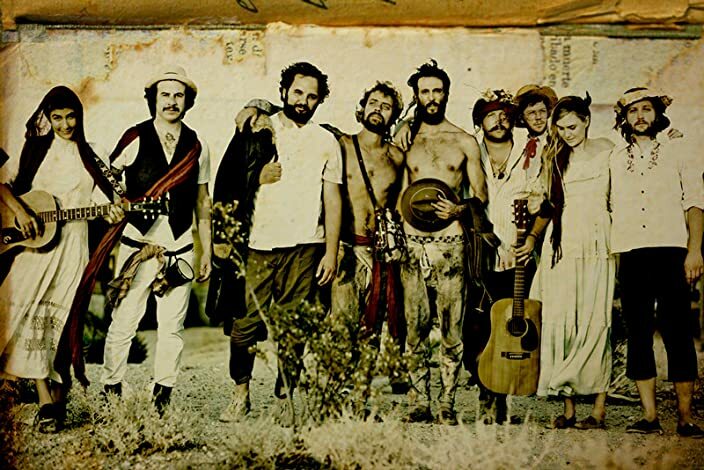 ¶ But to understand where Edward Sharpe and the Magnetic Zeros are now, you have to know where they’ve been. After fronting electronic rock band Ima Robot, singer Alex Ebert exited the LA party scene and entered himself into rehab. Eventually, he came out clean—in an unshowered Appalachian hipster sort of way. It was then that Ebert took on the persona of Edward Sharpe, a Messianic figure who represents Ebert’s rebirth into a new man. Not long after his stint in rehab, Sharpe saw singer Jade Castrinos sitting outside on a bench, and later claimed he knew immediately that he had to have a relationship with her. ¶ The two fell in love and started singing together, slowly adding a rotating cast of 10 characters to their band. Once Edward Sharpe and the Magnetic Zeros formed, Sharpe wrote most of the material for the band’s 2009 debut. ¶ The title of Up From Below says it all. Sharpe was grappling with the battle scars he had received in his young life: the tenuous relationship with his father, the pain of death, the selfishness of his addiction, and so on and so forth. Three years, a few tours, and plenty of new material later, the band’s Messiah-like frontman has arrived somewhere on the other side of that sadness. ¶ On Here, Sharpe proves right out of the gate in “Man on Fire” that he has found a resolution—the album’s first track is a Johnny Cash-style ballad of freedom. Lyrics like, “Want the whole damn world to come dance with me” are rife with the naivety and truth everyone experiences after a rebirth. ¶ Holding the second slot on the disc, “That’s What’s Up” is guaranteed to be the most popular song on the album. With New Orleans-style horns and a soulful 70s sound, it’s impossibly catchy — much like ‘Home’ was on Up From Below. But after singing sappily about their relationship before, “Thats Whats Up” proves that the two former lovers have found something even purer in each other: true friendship. The lyrics are unquestionably hokey (like, “I’ll be the sun, you be the shinin’”), but the chorus gives Jade Castrinos her first opportunity to showcase her powerhouse vocals on the album. ¶ In a world where too many artists err on the side of overproduction, Here is decidedly under-produced. In some tracks, like “I Don’t Wanna Pray,” the lack of production gives Sharpe’s voice a dreamy quality that lends itself to the storytelling. The less-than-stellar production value adds an element of honesty to this song about acknowledging God’s presence, but refusing to pray to him. Unfortunately, in other tracks – like “Dear Believer,” “Child,” and “One Love To” — the lack of vocal sharpness makes it difficult to listen without distraction. These tracks are in succession, giving the second half of the album a slow start. ¶ Castrino’s vocals in “Fiya Wata” will snap you back to attention before Here closes with “All Wash Out.” Despite a three-track slump, Here isn’t the kind of sophomore album that will disappoint fans of Edward Sharpe and the Magnetic Zeroes. They’ve certainly has crawled out of a dark place, but they haven’t lost any of the fervor developed through life’s difficulties. At the same time, Here isn’t a naïve take on optimism: the band has found the salvation and peace they were looking for — but they know that pain and sadness lurk around every corner. ¶ Luckily, Edward Sharpe and the Magnetic Zeroes found a way to translate that life lesson into their music without losing the quirky evangelic charm that attracted listeners in the first place.